The Massachusetts Supreme Judicial Court, the highest court in the state, held on January 29, 2018, that employers are not required to pay out accrued, unused sick pay to employees upon separation because sick pay is not considered “wages” under the Massachusetts Payment of Wages Law, M.G. c. 149, § 148. In Tze-Kit v. Massachusetts Port Authority, the Port Authority’s sick leave policy provided that, upon termination, employees received a certain percentage of their accrued, unused sick leave based on their tenure. Employees who retired from the company or died received a higher percentage, however, if an employee was terminated for cause, they received no payout. In this case, the Port Authority initiated disciplinary proceedings against the plaintiff, who was near retirement. Before he was terminated for cause, he applied for retirement. Upon his termination, the Port Authority refused to pay the plaintiff any of his unused, accrued sick time, pursuant to its policy. After the plaintiff disputed this decision, the parties entered into a lengthy arbitration process, lasting over a year. The arbitrator found that the plaintiff retired prior to his termination and was thus due the full amount of his accrued, unused sick leave and the Port Authority paid the plaintiff. The plaintiff then sued the Port Authority alleging a violation of the Payment of Wages Law because he did not receive proper payment of final wages upon termination in accordance with the statute. According to the Payment of Wages Law, resigning employees must receive their final wages, paid in full, on the next regular pay day. Employees who are discharged must be paid in full on the day of discharge. The trial court found for the plaintiff and the Port Authority appealed. The appeal turned on the question of whether accrued, unused sick pay is considered “wages” subject to the final wage payment statute. The statute does not define “wages,” but indicates that the term “wages” includes holiday or vacation pay due to the employee per agreement and includes commissions that are “definitely determined” and that are due and payable to the employee. The Supreme Judicial Court noted the statute does not specifically include sick pay in the definition of “wages,” but did not consider the absence of “sick pay” from the statutory language a determining factor. Nevertheless, in analyzing the legislative intent, the court determined the Legislature intended to exclude sick pay as wages because employees’ use of sick time was conditional upon their illness, or the illness of a family member. Thus, an employee does not have an absolute right to sick time payment. Moreover, it is common for employers to have “use it or lose it” sick time policies. The Port Authority’s payout policy was essentially a contingent bonus paid to separating employees if they did not use up all their sick time and did not engage in “termination for cause” conduct. The only contingent compensation explicitly referenced as wages under the statute, however, is commissions. Although this decision clarifies that unused accrued sick pay is not required to be paid as final wages, employers in Massachusetts should keep in mind that employers must pay accrued, unused holiday and vacation pay and earned commissions due to the employee within the time frames set by the statute. The court’s holding is limited to sick pay only and would likely not apply to paid time off that may be used as sick time—that time would still be considered “wages” that must be paid upon separation. Employers are required to make final wage payments to employees who resign on the next regular pay day. 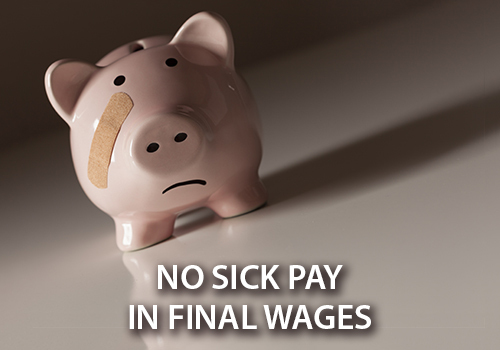 Employers are required to pay final wages to discharged employees on the day of discharge.